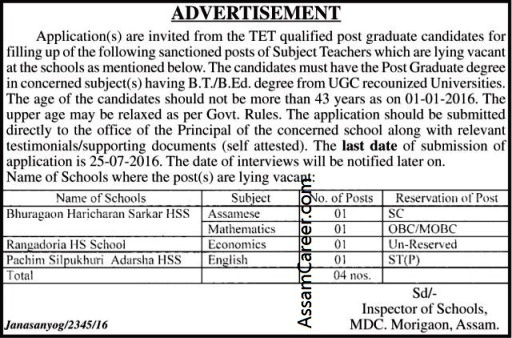 O/ o Inspector of Schools, Morigaon. 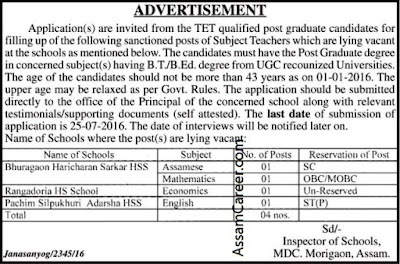 Applications are invited in Standard Form from intending HS TET qualified Post Graduate candidates for filling up the following sanctioned Subject Teacher posts in the below mentioned schools of Morigaon District. The candidates must have post graduate degree in concerned subjects along with BT/BEd from UGC recognized university. The date of interview will be informed later. The age should not be more than 43 as on 01-01-2016. How to apply: The applications along with all testimonials from HSLC onwards must reach the office of the Principal of Concerned HS Schools during office hours by 25/07/2016.